Ipheion uniflorum blooms in the depths of Winter in our gardens. The Spring Star flower blooms just a little earlier than its name might indicate. Blue flowers will be showing off their colors intermittently from Fall to mid Spring. 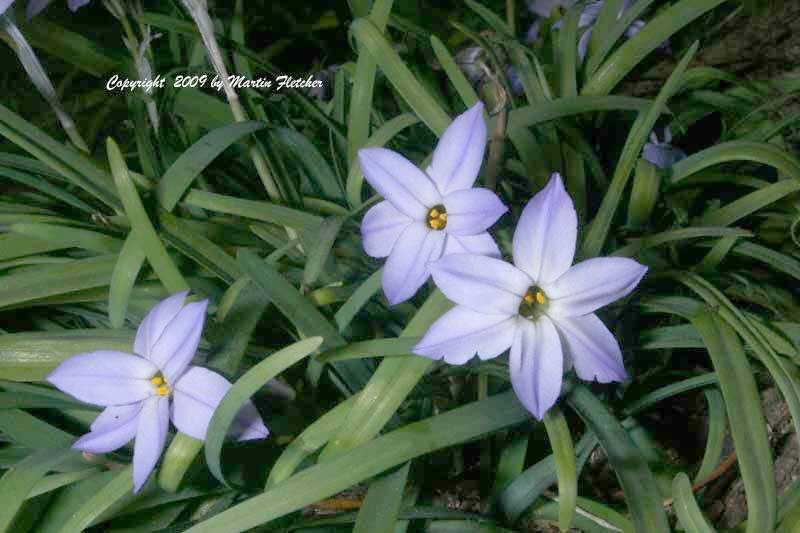 I use Ipheion uniflorum for a little color in a lawn, or for a surprise element in the garden. The bulbs do quite well without additional irrigation. So I plant them along pathways or in a lawn where I want the meadow look. This photo was taken in at the base of a large liquidamber in February, though the plants do equally well in full sun. Ipheion uniflorum is hardy well into the single digits. Blue striped flowers of Ipheion uniflorum - Spring Star Flower. High resolution photos are part of our garden image collection.